Dining and kitchen are pleasantly connected for cozy, casual meals. You'll notice an opening out into the laundry and pantry area just past the dishwasher. West facing front of 2519 S J, a cozy rambler set high above J Street for privacy and quiet. Set on a bank high above J Street, this rambler offers simplicity and convenience on a single floor. From the back yard, catch glimpses out to Mount Rainier and south to Lincoln High. Inside, enjoy a cozy and open living space from kitchen, to dining, to living room. The home was fully updated in 2013, the roof was replaced within the last 5 years, and the interior walls are freshly painted, so it’s ready for you to move in and get settled. The en suite bedroom with its private 3/4 bath. A favorite feature of the previous homeowner is the privacy of the en suite 3/4 bath. The flexibility of 2 bathrooms goes a long way toward making this a comfortable home. Engineered hardwood and granite counters add color and texture in the kitchen and dining area, with laundry and pantry just beyond. You may park on J Street below and take the stairwell up to the gate under the arbor, but it’s more common to enter from the quiet, paved, dead-end alley. Since there’s no outlet it’s very low-traffic, mostly just neighbors and visitors back there. A paved driveway extends from the alley into the attached garage for more off street parking. You’ll find this home about half a mile from the entrance to the Hilltop’s Business District, and 1 mile from downtown museums. That means you’re not far at all from cafes, community centers, coffee roasters, medical centers, schools, parks, and culture of all kinds. You’ll find a whole location section below to introduce you to the neighborhood, or just help you get to know it better. Continue on for the video tour, photos, Hilltop neighborhood highlights (including travel time and distance to a list of Tacoma favorites nearby), and many more details about this home. View into the living room from the hall leading to bedrooms and bathrooms. 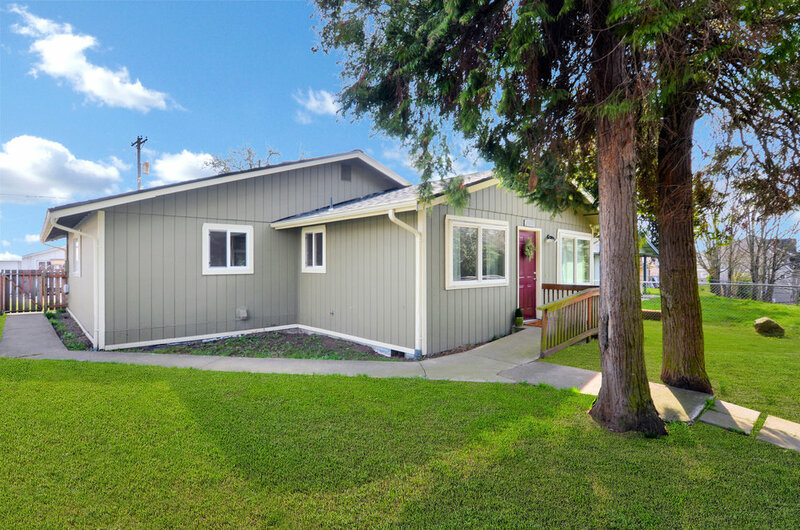 A fenced yard with mature cedars and paved paths welcome you to this single floor home with its open living space. Completely updated in 2013 with the whole roof replaced within the past 5 years. The front door opens into the living room which flows seamlessly into the dining area to the left, and the kitchen. Take the hall toward the full bathroom and bedrooms, and keep going to find the suite with its private 3/4 bath. The living space is open to the kitchen so guests and family can socialize easily, or parents can keep an eye on kids while working on dinner. The door to the left opens into a coat/storage closet. If you enter from the welcoming red front door, you’ll step right into the heart of this home. The living room, kitchen, and dining area are open to each other, so it’s easy to fix dinner while visiting with friends or keeping an eye on kids. The living room windows look south to the side yard and west to the fully fenced front yard creating a bright spot to sit and read. And since the house is up on hill, street traffic is far below. A coat or storage closet adds convenience to this simple, open room. Corner windows create a bright spot for reading, and the engineered hardwood floors stretch to the entry area giving a space to stop and remove shoes. The dining room overlooks the yard set high up above J Street. Engineered hardwood floors and freshly painted walls complete the room. The dining room directly adjoins the kitchen and overlooks the front yard with its big cedars and arbor at the stop of the stairs. Engineered hardwood floors give a warm tone to the room and extend seamlessly into the kitchen. Set up your dining table, add a nice area rug, hang some family photos or favorite prints on the wall, and you’re ready to gather for meals. Open kitchen with granite counters, engineered hardwood floor, undermount sink, and a full set of silver finish appliances (refrigerator, stove, vent, and dishwasher). Great amount of counter space! This half wall with its window to the living space and island-stye counter adds character and lots of work and storage space to this kitchen. Window light and counter space are some of the best parts of a good kitchen. This one has both, along with the added benefit of no dead-ends! There’s actually space to cook with another human being here. The half-wall with its long counter top and additional cabinets below provides just the right amount of separation from the living room while still maintaining the open flow. Granite countertops and backsplash bring a nice sense of quality and interest to the room along with the warm tones of the cabinets and the engineered hardwood floor. Don’t miss the undermount sink with its stainless double basin. Undermounts are wonderful for ease of cleaning, no grout or raised edges, so wiping counters is smooth. The kitchen includes a full set of silver finish appliances, and beyond the many cupboards on-hand within the room there are some pantry shelves just past the stove in the laundry room adjacent. Get cooking! A view from the entrance to the laundry room/pantry into the kitchen and living space. The kitchen is set up with a nice number of drawers and cupboards for keeping everything organized. This en suite bedroom features a private 3/4 bath, large sliding closet doors, and the freshly painted walls found throughout the home. Tucked away at the end of the hall, this bedroom with its private bath overlooks the back yard with a mature pear tree outside the window. When we asked the homeowners some of the things they liked best about this rambler, this suite was at the top of the list. Find this bedroom with its private bathroom at the end of the hall on the left. The bedroom window looks east out to the back yard with its pear tree. Sliding closet doors, carpeted floors, and freshly painted walls complete this room with its 3/4 bath just a few steps away. The 3/4 bathroom offers a shower stall and a vanity with storage for keeping things tidy. 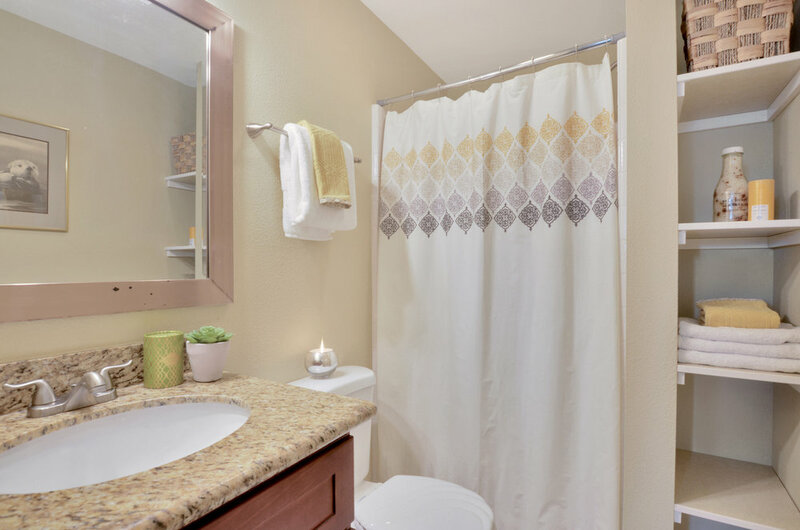 Tuck linens away on the shelves, bring in a shower curtain you love and you’ll be right at home. The private 3/4 bath attached to the main bedroom features a shower, vanity with storage, and shelves for linens and decor. Find 2 additional bedrooms off the hallway with easy access to a full bathroom. Comfortable and carpeted these bedrooms overlook the side yard and are perfect for kids, housemates, or guests. The en suite bedroom with its 3/4 bath goes to whomever has first choice, but there are still two bedrooms ready for kids, guests, or housemates. You’ll find these two rooms down the hallway on your right with easy access to the full bath. Their windows face south overlooking the side yard. Depending on your family and your needs, furnish both these rooms as bedrooms, or make one a den, play room, or home office, as shown below. Not shown in the photos, but a feature well-worth appreciating, is a hall cupboard where you can stash extra sheets, blankets, gadgets, and games. This 3rd bedroom makes a perfect room for kids or guests, or could even be set up as an office or play room depending on your needs. A full bath is accessible just down the hall from the living room and near the bedrooms. A shower/bath combo is lined with a tub surround and the undermount sink on the vanity makes for easy cleaning. Located down the hall from the living room on the left, this full bath is easy to reach from the main living space or the bedrooms. The bathtub/shower combo is fitted with a white tub surround, and the undermount oval sink creates, once again, an easy to clean surface. This is a nice, simple bathroom with a vinyl floor, good lighting over the mirror, and some storage in the vanity cupboard. Brightened by a window to the back yard, and with a back door that leads into the attached garage, this laundry room is all set with washer, dryer, folding counter, storage cupboards, and pantry shelves. 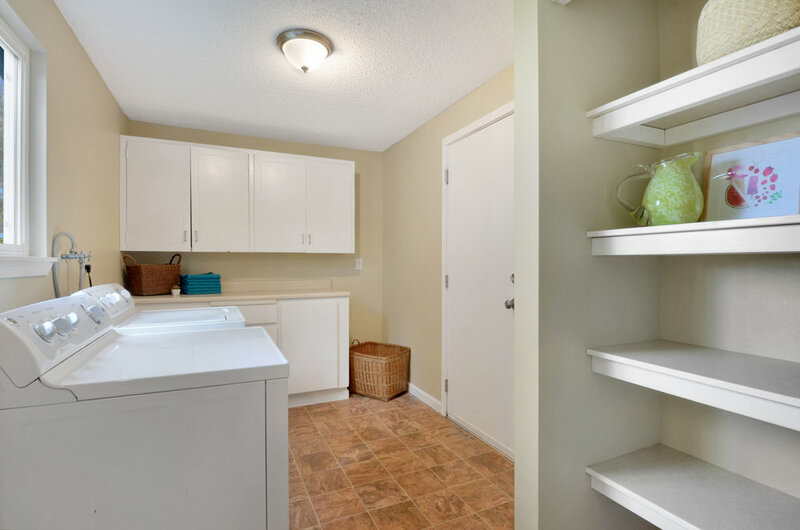 A truly convenient feature of this home is the laundry room with pantry shelves located just outside the kitchen. Anyone who has lived without a laundry room, or has always needed to go down a dark flight of narrow stairs to the basement to reach the washer and dryer in a creepy corner, knows this convenient laundry room adjacent to the kitchen is nothing to sneeze at. It’s all set for you with cabinets, a folding counter, natural light through the window overlooking the front yard, and even some shelves for pantry items near the door to the kitchen. A back door opens into the garage, so this is where you’ll step into the house if you choose to come in the back way from the alley. Either way, welcome home! From the paved alley (alley dead-ends so there's no through traffic) drive up to the garage, or park on the paved driveway. A gate on the right opens into the front yard with a paved path leading to the front door. Or go in through the garage to enter at the back of the house. The attached, single-car garage offers a place to park indoors, or could be used more as a tool shed and workshop if you’d prefer to park out on the paved driveway. This driveway and garage are at the back of the house, accessed from the paved alley off S. 25th St. There’s no outlet, so the traffic back here comes mostly from the neighbors. From the driveway, a paved path extends around the corner of the house, beyond the gate, and onward to the front door. You can also just go in through the back door from the garage itself. There’s room to build a shed out here, or even to do some landscaping to keep the pear tree company. Mature cedar trees, paved paths, and space for landscaping or garden beds right alongside the house. Use the gate on the left to get to the back yard and driveway. There’s even an arbor at the top of the stairway up from J Street (not shown). On this lot you might find yourself using the front yard more like a back yard. Since it’s fully fenced and set up high above the street, it’s a good place for pets and for playing. An arbor arches over the gate at the top of the stairs from J St, and 2 cedars flank the path to the front door. The paved path leading around to the back and up to the front door creates some shape and suggests areas where flower beds or veggie gardens could fit right in. The yard is a blank slate, ready to be kept simple, or ready for all your ideas, like a patio, or raised beds, or a climbing vine for the arbor! This front and side yard function like a private back yard since they’re set up and away from the street. In back, find the mature pear tree and off street parking. “Dream Coming True” mural by Bob Henry at S 9th & Martin Luther Kind Jr. Way. If you’re getting to know the neighborhood, take a look at our list of favorite Tacoma destinations below. We’ve calculated the distance from the doorstep of this Tacoma rambler, as well as the time it takes to drive or walk to these popular spots. And don’t miss the section on community advocacy and engagement in the Hilltop! Image from Metro Parks Tacoma. McCarver Park, just a 4 minute walk from home. Image from University of Washington Tacoma. The steps at the heart of the UWT campus, less than a mile from home. Image from Tacoma Center YMCA. Work out at the YMCA just 5 minutes from home. Image from the People’s Community Center. Exercise and play at the People’s Center, 4 minutes from 2519 S J. Image from Hilltop Street Fair. Get in on the annual street fair in August! Image from Tacoma Community House. Education and advocacy work in the Hilltop for over 100 years! The Hilltop Neighborhood, where you find this home, is a diverse community set on the hill above Tacoma's downtown. Churches dot the corners, the recently beautifully renovated McCarver Elementary School and its playground are just a few blocks away. St. Joseph's Hospital and Community Healthcare's Hilltop Family Medical Clinic are close by. There's even a Link light rail project in the works, to be completed in 2022. The Link will further connect Hilltop to Downtown Tacoma and the Stadium District, providing increased access for those who don’t own a car, or prefer (for all kinds of reasons!) to use public transit. Go for music and art at Alma Mater, or coffee and brunch at Honey. 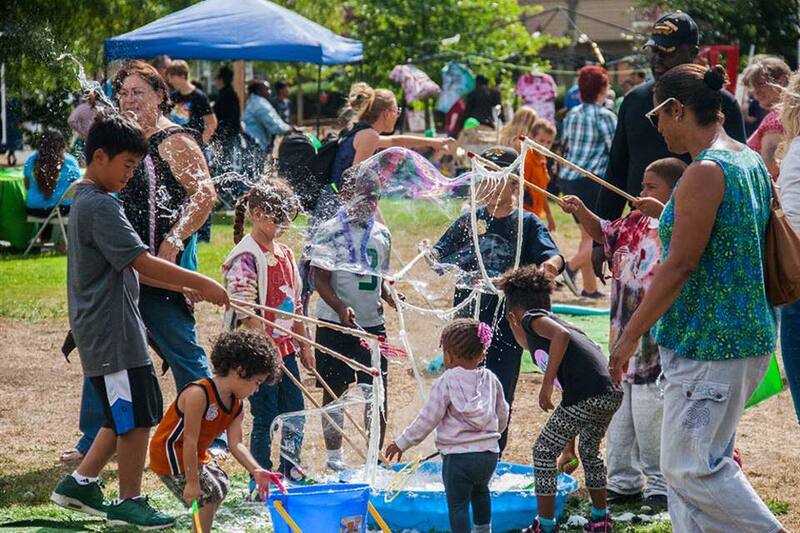 Find some green space at People's Park, get to know your neighbors at the People's Community Center, and enjoy the annual Hilltop Street Fair every August. Enroll your kids, or volunteer in the comprehensive tutoring and mentoring programs at Peace Community Center. Hilltop offers a myriad a ways to get involved, give back, engage, and belong. Did we mention Tacoma Community House? No? Well, it’s more than worthy of a mention. Their advocacy work began over a hundred years ago and they’re going strong in their work with refugees, immigrants, employment, and education. Image from Red Elm Cafe. Your friendly neighborhood cafe. If you’d really like to engage in this neighborhood, understand its roots, its concerns, its causes, and get deeper into what it means to participate in this community, get involved in the Hilltop Action Coalition. The HAC meets the 3rd Monday of every month at 6 pm in the community room at the Hilltop Regional Health Center. Know your neighborhood! The heart of the Hilltop's business district stretches between S. 19th and S. 9th on MLK Way. Favorites on MLK include The Fish House Cafe, a tiny blue restaurant serving fried fish and shrimp baskets for decades, Mr. Mac Ltd clothing store (opened in 1957 - read more about this Hilltop icon in this News Tribune article! ), Johnson's Candy Company (since 1949! ), and Pho Bac and Pho King offering inexpensive Vietnamese food. Newer additions to the neighborhood like Red Elm Cafe, 2nd Cycle Community Cycle Center, and bars like The Eleven Eleven Bar, Zodiac Supper Club, and 1022 S J (craft cocktails and food too) indicate the ever-changing character of this area. Come see this Hilltop Rambler in person! In the meantime, for more information about this home, call or text me, Michael Duggan, at 253-226-2787. I'll be happy to answer your questions about this home or the local real estate market in general.